A group of investors wants to buy their insurance businesses. The offer of a takeover windfall might appeal. But the easy transition they promise and the need for no taxpayer backstop sound unlikely. The plan wouldn’t end the cycle of privatizing profit while socializing losses. 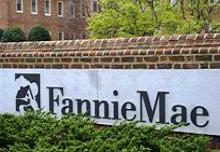 Fairholme Capital Management sent a letter to the Federal Housing Finance Agency and U.S. Treasury on Nov. 13 offering to buy the insurance business of mortgage guarantors Fannie Mae and Freddie Mac. The two firms, which held a government charter to help boost home ownership, were taken into conservatorship in 2008 after losses on home loans ate through their capital. The two required about $190 billion from taxpayers in subsequent years to survive. The Fairholme plan is supported by several other big investors who together hold a large portion of the firms’ preferred stock. They’re proposing to convert those to common shares and acquire an additional $17.3 billion in cash to capitalize the new entities. The investors say that the new mortgage insurance companies could function with or without government backing.